The leaking of journalists’ personal data by a Ukrainian website indicates that the situation in the country is alarming and it is incumbent on the authorities to step in, investigative journalist Russ Baker told RT. The personal data of over 4,000 members of numerous international media outlets has been published on a Ukrainian website called “Mirotvorets” (Peacekeeper). The list includes employees from such organizations as the BBC, CNN, RT and Human Rights Watch. The Kiev-based website claims that all the journalists “co-operated with terrorist organizations” and breached Ukrainian legislation. 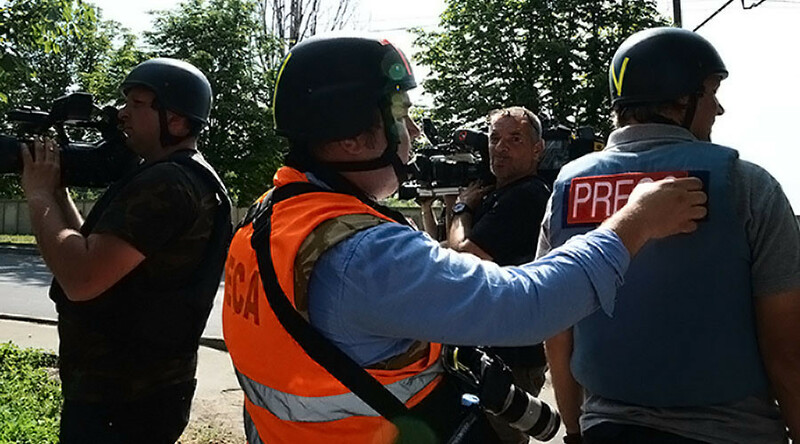 Following the incident, the OSCE (Organization for Security and Co-operation in Europe) and a number of journalist organizations have voiced concern over the safety of mass media representatives working in Ukraine. RT: There has been a very cautious reaction to the revelation of the journalists' personal data being published. Why did it take some time for the organizations and media outlets to react? But this is a growing problem in the online world. The situation in Ukraine is particularly striking, because the fact that these people even think that a journalist going to an area makes them an enemy, that just indicated kind of how the extremism has risen to a rather staggering level. Journalists always go to warzones. They always go to places where there is conflict. And to think that by definition that makes them unfair or somebody who needs to be threatened - I think it is pretty staggering. RT: The Ukrainian Prosecutor General's Office announced it has opened an investigation into the publication. Will that make the website delete any of the data, or has the damage already been done? RB: I think the damage has already been done. Investigative journalists need to look more closely at the relationships there: the fact of this site even existing; what level of tolerance was there; that relationship with law enforcement people in Ukraine – all of these are very, very troubling. And they are the exact thing we ought to be looking into. RT: A group of Ukrainian and international journalists have called the data publication illegal. Do you agree with this statement? RB: I don’t know of any law against publishing information about anyone. That doesn’t sound right to me. But certainly it is unethical and it is immoral. RT: What can be done to make the Ukrainian website delete the personal information it has? Are there any legal recourses against this, or this is a freedom of speech issue? RB: I don’t think that is a freedom of speech issue. When you’re tacitly suggesting that bad things are to happen to people with physical consequences, where there is track record of those things happening – it is incumbent on the Ukrainian authorities to step in. They have every reason, I would think, even to raid the premises, wherever that might be. And I know it’s apparently not so easy to track these people down. But I am sure they know who they are and where they are.